Meet Christen and Brandon Fisher. Their love story is vampire meets zombie. Intrigued? Keep reading! This is their Love in the BOI story. Brandon and I met working as actors at a haunted house in Arizona. Just a classic love story between zombie and vampire! Our friends had asked us if we wanted to make good money while working a interesting job. I had seen him from across the room and was immediately struck (later he told me the same). I was so shy though I barely spoke to him whole month we worked there because I had the biggest crush! On the last day [of the haunted house] I thought this was now or never, so I asked for his number so we could go to the company Halloween party together. There would be our first kiss too by the way (and I still had my pointy teeth in haha!). We started dating after that and found out we had just missed each other in the same schools and he only live a couple miles from my house which in Phoenix is a big deal. We have been through everything together including long distance so I can finish school. The first time it was up north in Arizona, the second was when I was accepted to go to a school in Idaho. When we learned that, we had been together for 4 years and he decided that was when he was going to propose. Now, Brandon had never gotten me flowers because at first he thought they were a waste of money since they just die anyway (men. ), but then he realized that would be a good way to propose eventually. So he asked my mom to take me out shopping. When we came back to our apartment he had filled it with bouquets of flowers for every event that he had missed giving them (birthdays, valentines day, etc.). In the middle was a box that said open me. I was in shock. Inside it said turn around. When I did, he was dressed up in a suit and down on one knee. He was so nervous he blurted out “would you marry me?”, and after I (tearily) said yes he admitted he had a speech ready but he was so nervous he forgot! So then he said it and it blew me away. We planned to get married in two years after school in Idaho. And we ended up getting married this past June in McCall! What is Your Advice for Those Looking for Love? As far as the advise for people looking for love… you can find love in unexpected places. We put ourselves out there signing up for a odd job and ended up finding soulmates. Be open to opportunities but if it doesn’t happen just enjoy the time while you are out there. You will know when you are gradually going through the dating steps and it just feels natural and easy. Everyone is different and there will be ups and downs, but I know Brandon and I never felt any doubt that we were going to end up together forever. What Is Your Favorite Thing To Do In Boise? Now that we live in Boise it is truly hard to pick one thing that we love to do here. We love to go hiking in the foothills, paddle boarding at the different lakes, running with our dog on the greenbelt, checking out the nightlife downtown. trying out different restaurants, or going to the myriad of events always going on in Boise. We love it! I think we found our paradise. In 2014, Mallory went to the Mayhem Festival. Although since she was young she knew she would meet her future husband at a concert, Mallory probably didn’t know it would be this one! Meet Mallory and Tommy. We met at Mayhem Festival in 2014! It was too perfect because growing up, I always knew I would meet my future husband at a concert! What advice do you have for those looking for love in Boise? For those looking for love in Boise, I advise that you look in places where you least expect it. Branch out and get out of your comfort zone! Maybe attend a class that you haven’t been to before. Where is your favorite place to go (or thing to do) together as a couple? Thank you, Mallory for sharing your LOVE in the BOI story! Imagine only being able to communicate with each other in a beginner’s American sign language class. This is Sarah & Zac’s Love in the BOI story. We were paired up during a beginner’s American sign language class in college and weren’t allowed to actually speak to each other those first few weeks – just awkwardly try to sign. We met in Vancouver, WA, but one of the first things we did together as a couple was come to Boise to meet Zac’s mom and great-grandmother. It was a bit intimidating for me, but I ended up loving his family and we had such a good time exploring the city. We were married in the Idaho State Capitol and when we started our family we decided that Boise was the place we wanted to live. It was one of the best decisions we’ve ever made! Our advice for people looking for love in Boise is that it comes when you least expect it. Pursue your dreams and passions and you are bound to run into that special someone. What is your favorite place to go (or thing to do) together as a couple? Our favorite thing to do as a couple is travel. We have a goal of taking our son to all 50 states and 7 continents! We also love camping at Redfish Lake. Want to follow Zac and Sarah on their adventures? Make sure to give them a “follow” on their Instagram pages: Zac @zacwarren56 and Sarah @raisingsmiles. Photo credit to Maggie Grace at @maggiegracephoto. To celebrate the month of love, I asked local couples to share their stories of how they fell in love in the City of Trees. How did you and Devin meet? We met at a friends’ wedding; my friend Catalina and his friend Gabe were getting married. He approached me on the dance floor and complimented my outfit. We talked the remainder of the evening and exchanged phone numbers; he asked first of course. Our first date was very simple and casual, my style. We went out to dinner to Matador, a local Mexican joint. We realized later that both of our favorite food was Mexican. We barely ate but instead talked for 2 hours getting to know one another. After dinner, we went to his place and watched a movie. We were inseparable from that moment on. Don’t be so picky, but don’t settle either. What I mean by this is lose your “type” or the idea of a “perfect” person because it will limit who you meet based on your own judgement but don’t allow your character to be questioned based upon what you think the other person will like. Believe your worth because there’s only one of you and every person deserves love. People often, myself included, confuse lonely and alone. If you feel lonely, you’re better off being alone. I also truly believe you have to love yourself first before you can love someone else and allow them to love you back. We love to go anywhere outdoors. We love to hike and/or backpack with our pups through the wilderness; one of our favorite spots is Stanley, ID. It’s one of our favorite ways to unwind and disconnect from the hustle and bustle of work and social media stress. For us, it’s the best way to spend quality time together and go back to basics. FYI – I enjoy Sladja’s instagram page and been following her for some time. I was even behind her in line when Bleu Bird Cafe closed a few weeks back. Make sure to give Sladja a follow! Do you have a Love in the BOI story? Feel free to email me at theboisebucketlist@gmail.com. Date: November 24th, from 5pm -6:30pm. Get ready to snuggle with your loved ones as you enjoy the holiday tree lighting. It’ll be held at The Grove, and festivities begin at 5pm. Entertainment by Red Light Challenge and the Boise Men’s & Women’s Choruses. Looking to find some homemade goodies you can give as gifts? The 2017 Wintry is here and will be held at JUMP. The market will be open and free to the public this Saturday and Sunday from 10am – 5pm. Date: November 22nd – November 28th. Last year, I attended this wonderful event and I highly recommend it. For so many reasons. All funds raised will support the expansion of Saint Alphonsus. You get to walk around and be surrounded by all of the holiday splendor that makes you feel warm inside. 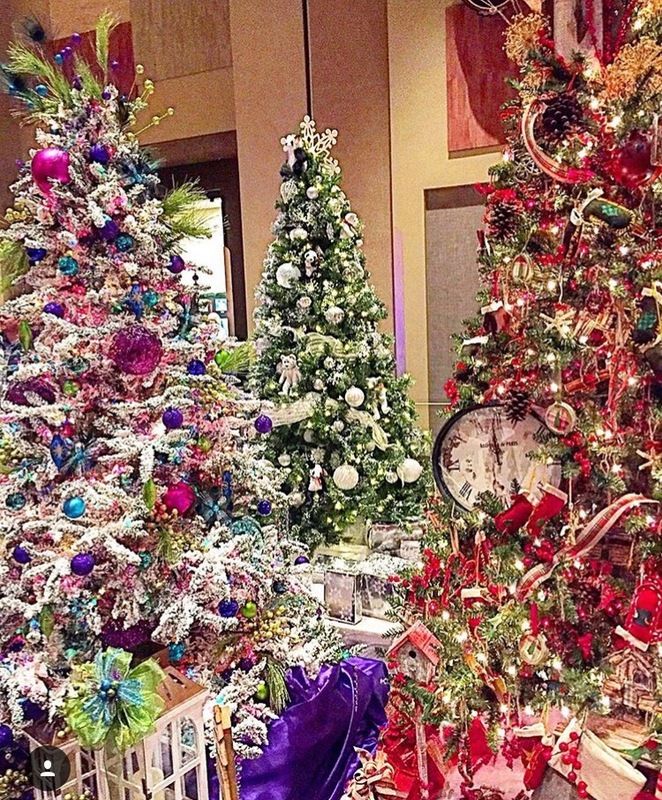 Let’s not forget the hundreds of decorated Christmas trees, wreaths, and holiday decor. It’s the 20th anniversary of the Idaho Food Bank Empty Bowls! The Empty Bowls is where you get to choose from hand-painted bowls from professional and amateur painters, students, and studios. After you select a bowl, you can then enjoy a hot bowl of soup generously donated by one of the local Boise restaurants. Over 3,000 bowls to choose from, and bowls start at $10.00. It’ll be held at the Boise Center. *Parking WILL BE FREE on Friday. Recommendation: ARRIVE EARLY! I made the terrible mistake of attending around 12pm. The line was long, wrapped around Main Street. I’m movie geek and fanatic, so when Boise Classic Movies released its holiday schedule, I screamed with joy. Maybe not scream, but definitely got giddy. Some of the movies showings include beer and wine (21+). I believe these will all sell out, so grab your tickets early. Plus, you get to watch it in the coolest place here in Boise: The Egyptian Theater. I’ll admit — I’m not the best when it comes to ice skating. BUT for the holiday season, I’ll put on some ice skates. The Village of Meridian now has an ice skating rink in Fountain Square. Its open from November thru January. Ticket prices start at $5.00. Enjoy a night of ice skating, then grab hot chocolate at Village Coffee, and sit by a warm fire. The Garden isn’t only for the warm months. The Idaho Botanical Garden becomes a dazzling display of lights during the holiday season. Over 380K lights, to be exact. On select nights, you can even see Santa and enjoy the sounds of local choirs. If you’re willing to drive further, your options expand! Date: Friday, December 15th and go through Sunday, December 17th. When I was growing up, my parents brought my siblings and me to see the Nutcracker. My sister especially loved it because she was into ballet. When I close my eyes and think of Christmas, seeing the Nutcracker is part of that vision. Luck for us, we have a chance to see the Nutcracker live at Ballet Idaho. This year, Ballet Idaho is hosting Nutcracker parties prior to each performance! Snag your tickets early because these showings HAVE SOLD OUT! Not kidding. You’d think you’d have to travel to New York City to enjoy a classic carriage ride. Or, at least that’s what I see in the movies. Starting in late November, you have the chance to enjoy a FREE carriage ride in downtown Boise. Yes, I said FREE. Pickup is in front of the Washington Trust Bank 9th Street downtown Boise. Date: The concert is December 8th at 7:30pm. Want to have a fun FREE day at the zoo? On Saturday, December 2nd starting at 10am, you and your family can enjoy all the zoo offerings. Santa Claus will visit the zoo for photo ops. You can’t help but to enjoy a good, entertaining holiday parade. On Saturday, November 18th, come to downtown Boise and enjoy the “Storybook Christmas” at this year’s Boise annual Holiday Parade. The parade kicks off on Jefferson at 10th Street and heads to 4th Street. Date: Friday, November 17th from 6pm – 9pm. If you haven’t driven to Caldwell for its Winter Wonderland, you’re definitely missing out! I attended this last year, and I’m so happy the time has come where I can go again. You have the beautiful light display in downtown Caldwell. Lots of children activities, music, and plenty of vendors. Want to experience Broadway in Boise? As part of the 2017 – 2018 season, Elf the Broadway Musical will be playing at the Morrison Center. After you see the classic movie at the Egyptian Theater, head over to the Morrison Center to see the Broadway Musical! Last year, I attended the Idaho State Capitol Christmas Tree lighting right after work, and it was absolutely worth it. There was free hot cocoa and cookies for everyone. After the tree lighting, you can head inside and explore the Idaho State Capitol building. Holiday decorations are something that’s magical – amazing, even. With the vibrant reds and the deep greens to the holiday wreaths, you can get lost in the sea of beautiful holiday decorations. The Idaho State Capitol building does not disappoint. The interior of the Capitol building is absolutely amazing! Make sure to follow me on Instagram and use the hashtag #BoiseBucketList to share your stories of new adventures! A few weeks ago, I went to watch a football game at a local sports bar. I decided to smile more, be more approachable, and be open to small talk. I saw this so you can have some context. Raised in south Florida — population heavily influenced with the sounds and beats of other cultures — I’ve been conditioned that when I go out, you don’t really smile. You may flirt with your eyes and a smirk, but it’s unlike a sports bar experience. What I learned last year, local bars are heavy on the small talk and beer flowing. I’m not saying it’s new to me given I lived in Portland, ME. But I don’t really hang out at sports bars. But after asking people around where single locals hang out, I decided I had to step out my comfort zone. My decision to step out my comfort zone included being more approachable, drinking “buds” and engaging in small talk. This time, it must have worked. I was outgoing, smiled, and ended up chatting with a tall, blue-eyed man with a pretty smile and a sense of humor. His way of breaking the ice was to joke that my friend took his seat. I played along with the joke, and before I knew it, my friend and I were sitting 3rd row, 50th yard line at the BSU game. I’ll admit – the game was so much fun, especially since my friend never been to a BSU game. If you’re wondering, he had extra tickets because his date at the time cancelled last minute. Through our small talk conversation, he mentioned that he was a deputy sheriff. He even made a cute joke about “officer and lawyer” when I told him I went to law school. After the game, my friend and I ended up back at the sports bar to find Mr. Officer to thank him for the tickets. Lo and behold, he was at the bar. Alone. His friends decided to take the party on the road. Mr. Officer, my friend and I decided to head downtown to grab something to eat. We originally wanted to go to The Reef, but to our dismay it was closed. We ended up at Old Chicago for some late-night grub. I wasn’t in the mood for pizza, but I made it work. Toward the end of the night , Mr. Officer asked if we could “hang out” sometime and asked for my number. I smiled and without hesitation, gave him my number. Sounds like a good story so far, right? Nothing crazy. Well, except for him telling us that he is “fixed” and can’t have any more kids. He doesn’t want any more and rather date someone who already has kids. Ummm.. first of all, too soon to mention that? Maybe. Even if not too soon, a lot during dinner. I don’t think we even got to the “ex” part of the conversation yet. And secondly, I didn’t want to dive into whether I wanted children during that conversation. We were having fun, drinking, and eating. ( I do want children, by the way. In case you were wondering). I didn’t want to make that comment a big deal because I just met him and we had yet to go on our first date. Because I didn’t meet him on Tinder or some other ridiculous app , I was legitimately nervous about my date. For those who have met me in-person, I’m outgoing and enjoy meeting people. But there are moments when I get shy. I mean shyyyyyyy. Like that I-need-to-look-away type of shy. Mr. Officer suggested we go see It the Movie whenever I returned from my work trip. Oohhh, scary movie for a first date? Yes I love it. Oh c’mon , it’s ideal. You get to flinch and get close to your date. Which is exactly what I did. We first met at the Matador at the Village. Nothing like an adult beverage to calm your nerves. Soon thereafter, we headed over to the movie theater to get our seats. Mr. Officer was a gentleman and paid, for both the drinks and the movie tickets. Aside from It being a strange and creepy movie, I’d said the first date was a success. During the week prior to our movie date, and afterwards toward my birthday, he kept texting me. Asking me when I was going to Vegas for work because he wouldn’t mind joining me. Asking me if I ever been to Haunted World because we could go together. Asking me if I ever been to Jackpot, NV for gambling. Asking me how my day was at work. If you haven’t caught on, he would do nothing but ask me about future plans and seemed eager to do them together. Diana…c’mon now. Get to the good stuff. Disclaimer: the next few sections I’m going to be talking about my own experiences in Boise that I haven’t spoken about in my dating blogs. I didn’t feel the need to because I wanted to keep my blog posts entertaining. But I think with this recent dating experience, it’s fair to shed light on a few things. On my birthday, Mr. Officer offered to meet me at one of the local bars for a birthday drink. He ended up meeting me at Hannah’s and bought me a drink. He was out with friends to watch BSU play. All was fine & dandy until he started talking about how he never lived outside of Idaho. He probably won’t anytime soon given his custody arrangement with his ex-wife. Not strange at all. I know plenty of people who lived in one state all their life. Hmmm….what to say to that? Ok, good to know. I appreciate your candor and honesty. The conversation stayed on race for a little longer. He asked me if I dated outside my race, and I laughed saying I’m from south Florida, where it’s a melting pot. I directly answered by saying yes, I dated someone who is white. Fortunately, the conversation shifted when a song came on (Despacito, no less). Before I knew it, it was time for me to head home. My brother (fortunately) met me at Tom Grainey’s and we walked to our car. I was minding my business at a local bar (I won’t mention where), when I felt someone grab my right arm forcing me to dance with him to Despacito (I guess this song is an open invitation to dance with anyone who looks Hispanic because of course we want to dance to it). Rather than acknowledging that he startled me, he whispered in my ear that I need to relax and that he wasn’t like every “corny white guy” in Boise. Being told that he voted for Obama and does that qualify him to make me want to date him. Soon after asking me that, he dropped an entire PBR on my leg with no intention of picking it up. Constantly told how exotic I look (I guess it’s a compliment, but not when it’s repeated over and over by the same person and the inappropriate time & place). I say this because I want to give you some context to what I have to say next. It’s not like I haven’t been told something similar to what I’ve mentioned before. It just seems to me it’s been happening more frequently than I’d like. For those who are open-minded when it comes to dating, please understand this. If you meet someone from another race or ethnicity from yours, and they are showing interest, I don’t think it’s wise to start off any any discussion about “have you been with a ________ before?” Unless the person asks. If I asked Mr. Officer whether he’s dating/talked to someone outside his race, I’m curious and want to have a discussion with it. I’m only speaking from my experience, but that type of comment makes the person uncomfortable. And this goes two ways. My 2nd serious boyfriend in my life is white. He is 6’4, with deep blue eyes, and surfer tan skin. He was also raised in Naperville, IL and apparently raised around all types of cultures/races. That said, when I first met him, I kept saying comments in a joking way like I never dated a white guy before or you must like mixed girls if you’re talking to me. I’m cringing as I write these comments because I can’t believe I said that. My ex finally said something and told me it made him uncomfortable when I said those comments. It made him feel as though race was a big part of our relationship. I failed to realize he constantly thought he wasn’t good enough because of his race. Or he felt insecure when we would be out in public (yes, even in Fort Lauderdale, FL). I didn’t need to add to his feelings by making my own insensitive comments, regardless if a joke or not. I was younger, of course, but I learned a valuable lesson then. That lesson is what I brought with me to Portland, ME. I ended up having some weird situations while I lived there too. But the situations were few and far between. Fast-forward to now, I don’t talk to Mr. Officer anymore. He did text me apologizing for being MIA because he’s been sick. And I got some random SnapChat photo of his groin area (he was wearing jeans). He immediately messaged me saying “Sorry, my SnapChat is acting up.” My brother thinks it was mistake photo, but still. I’m taking a break from dating in Boise. I truly am. I have so much more positive elements in my life to focus on that dating isn’t a priority. At least not in Boise. If I end up going on a date, I need for him to “wow” me. Make me stop in my tracks. Impress me with his desire to spend time & get to know me. Until then, I highly doubt I’ll have any dating stories to share in the near future. Don’t worry – I’ll have some fun Dating in the BOI stories to share that are not mine. I’ll even host some Dating in the BOI activities. But as for me, I’m signing off as the primary dating blogger.